My apologies if you are receiving this newsletter for a second time. There was a technical problem with our mail system so I have resent this newsletter. If you are still having problems viewing this newsletter you can find it online here. I should also mention that there is only 3 days left to take advantage of Dr. Andrew Jones' offer in case you haven't had the chance to do that yet. Please don't delay, I don't want any of my subscribers to miss out. If you missed the newsletter yesterday you can find more info about Dr. Jones' offer below. 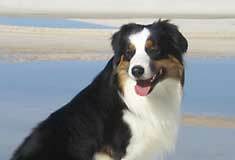 Welcome to another issue of the Australian-Shepherd-Lovers.com Newsletter. Please feel free to forward this newsletter to anyone you feel would also benefit from this information. If someone you know has forwarded this newsletter to you, you can subscribe here to make sure you automatically recieve future issues. In our last issue we told you about a great service (Ask a Vet) that lets you ask vets about your dog health questions online. We've had a terrific response and wanted to follow up with more information related to keeping your Aussie healthy (and out of the vet's office). Dr. Andrew Jones is not your average vet. He is not only concerned about the animals he treats he is also interested in making sure pet owners are educated about health issues and able to take care of their pets at home - even if it means fewer visits to his office are needed. He's a great believer in using natural treatments and remedies where possible and making sure your dog is eating a healthy and balanced diet as it is essential to staying out of the vet's office. Dr. Jones been a practicing veterinarian for over 15 years and operates the Nelson Animal Hospital in Nelson BC, Canada, along with the Second Chance Animal Shelter. Last Thursday Dr. Jones held the online seminar and it was a HUGE success - over 1000 people registered, and hundreds logged on to watch and hear him go into specifics about dog supplements. He has developed his own supplements based on his veterinary knowledge and experience and wanted us to help him introduce them to you. So he is offering a fr'ee trial for a very limited time. Only for the next four days. For the Next 4 days you can get a fr'ee Trial - all you'll have to do is pay for shipping. Which is reasonable, but you also get the following in addition to the supplements. When I first read his email telling me about his offer I thought "This is going to sound like a late-night infomercial," but Dr. Jones is really offering all of these bonuses as an incentive for anyone who is willing to just try his dog supplements! NEED to know that it is SAFE. PREVENT this from EVER affecting your dog again. Just for giving his New Supplement a fair try. GO here now to CLAIM your Free Bottle of Dr Jones' Ultimate Canine Health Formula, and Get All 5 Reports. But you've got to act FAST. >> Use this link to get your free trial. P.P.S. There are 1000 bottles of Supplement available - once it's sold out, then this special NO shipping charges EVER Bonus is OVER. This offer is available to subscribers of the Australian-Shepherd-Lovers.com Newsletter and is open to the public - so if you know someone with a dog who you would like to let in on this opportunity feel free to forward them a copy of this newsletter. Just be sure to let them know it's only going to be available for a couple more days and the Free Shipping Forever offer is on a limited first-come first-served basis. I'm sure you'll be very happy with the quality of the supplements developed by Dr. Jones and know you will get a LOT of valuable information in all the bonus reports to help you keep your Aussie healthy. Welcome! Whether you are a new Australian Shepherd owner or you have had an Aussie in your home for some time, you know how delightful, and frustrating, they can be. The joy of bringing a new puppy or dog into your household can be insurmountable. After all, there is no relationship quite like the one that is developed between you and your dog. A dog can provide unconditional love, hours of entertainment, and genuine friendship. Or, a dog can provide unconditional messes, hours of destruction, and a genuine nuisance! How do you ensure that your dog behaves in the manner of the first scenario described above? If you are thinking that the answer is "breed" you are partially correct. Indeed, breed does play a role in a dog's behavior. An Aussie's inate intelligence does give him an edge - but as many of you may have found out, that intelligence can be a two-edged sword. ;-) But an even greater factor in any dog's behavior is based on the training he receives. Good dog training resources can go a long way toward helping. If you are like most people, you are extremely busy. Some days, there just doesn't seem like enough hours to take care of yourself, let alone your dog! But, the time that you spend training your dog will reward you and your relationship for many, many years to come. 1. It builds a relationship. 2. It corrects behavioral problems. 5. It saves time, frustration and embarassment. Let's explore each benefit in further detail. 1. Training Builds a Relationship. There is no better way to create a bond with your dog than through the process of training. You may think that training begins at the time you decide to try new tricks, but it actually begins at the very moment you acquire your dog. Your dog is constantly watching you and learning from your actions. He learns from the way you react to his actions. He looks to you for guidance, for food, for warmth, for comfort, and for playtime. 2. Training Corrects Behavioral Problems. Barking at anyone who passes by the front window, chewing up your favorite pillows, digging through your freshly planted garden, bolting out of an open door...do any of these actions look familiar to you? When you have developed a trusting bond with your dog, you can teach him how to correct these behavioral problems. He will learn by your reactions whether or not his actions are acceptable to you. No doubt, he will test his limits! Yes, it is true that dogs are very curious creatures. With exposure to so many unusual smells, sights, and sounds, dogs can't help but want to explore. It's in their nature! Most dogs have the capacity to be very intelligent. But, they need to be stimulated first, and then they will be motivated to learn. Training is a huge benefit for stimulating your dog's intellect. The sense of "inclusion" is very important to a dog's security. From the earliest days of being a part of a litter, your dog feels comfortable being a part of the pack. That includes the pack of your household. You may be the primary dog trainer, but everyone in your family or household should take the time to train your dog. When he receives this undivided attention from everyone, he feels like part of the pack. 5. Training Saves Time, Frustration and Embarassment. Another huge benefit of training your dog is that it saves you time. Taking the time to train your dog now, will actually save you time in the long run. For example, if you take the time to train your dog to behave properly inside the house, you will actually be saving time cleaning up mischievous messes that he could create in the future - if he didn't have the training. This is not to mention the frustration of having a dog that doesn't listen or the embarassment of a badly behaved dog in public! Sharda Baker has published several dog ebook and audios. Click here for more dog training help and advice. The Photo Gallery section has opened.. Special thanks to everyone who has sent in their photos. We have a preview of the Photo Gallery here. If you don't see your picture there yet I will be adding more pics in the upcoming weeks and months. If you would like to send in your pics you can find info about how to do that here. Have a website about Aussies or a topic of interest to Aussie owners and breeders? You can add your site to the searh results and be included in the directory of sites included in the search. "My goal in life is to be as good of a person my dog already thinks I am.."
We love to hear from fellow Australian Shepherd Lovers like you. Send us your ideas, your feedback and photos of your Aussie so we can include them on the site.